Do you have a relationship with your paper manufacturer? Printers and paper distributors typically manage that relationship and do it very well. However, if you are exploring your paper options, we believe you should build that relationship and include the paper manufacturer. They offer unique expertise and access to resources that will enhance the collaboration. ARE YOU USING THE RIGHT FIBER TYPE? Work closely with your printer and paper suppliers. According to Gina Valentino, catalog expert and President of Hemisphere Marketing, “Always talk to your printer about the manufacturing process and learn about the printing parameters. This will help you determine which opportunities are best for your situation.” The paper mill can analyze your publication from a paper perspective, providing baseline insight the specifications and performance of your current substrate. Lisa Warburton, former Manager of Production for the Lenox Group Catalog said, “Remember that your paper suppliers are the experts and can recommend a change in weight to suit your goals, maybe moving from a 40-lb. stock to a 38-lb., or from a 45-lb. to a 40-lb.” They can provide plain and printed samples that allow you to understand paper performance and characteristics before you making any changes. To test if you understand your fiber types, take our quiz! The paper mill has access to paper-specific research and development resources that include testing equipment, pilot paper machines, in-house printing capabilities and a network of outside expertise. Another benefit of working with the paper manufacturer is their in-field support. A team of technical reps is focused on the after-sale experience, troubleshooting and serving as a resource for the printer when the paper arrives at the plant. They provide a level of hands-on expertise in the areas of paper, printing, web handling, paper quality, converting process and finishing, and will often be onsite when trial rolls run. 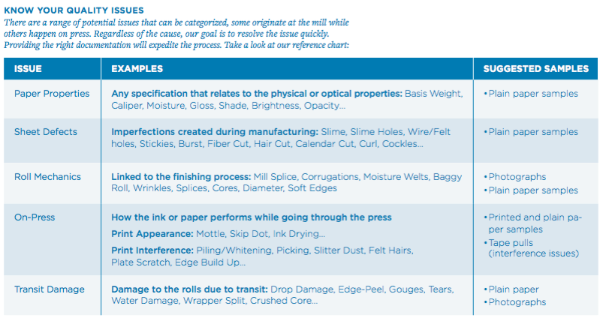 Wondering if you are the right scale to engage with a paper manufacturer? Don’t worry about it. Paper mills typically welcome the opportunity to understand the needs of a publisher. Not only can they provide a more targeted paper solution, but the collaboration can also often drive innovation.